Spotlight: Maintenance Plan Improvement - Get More for your money! At Prolink, we have been listening to customer suggestions and have decided to group both upgrades and support under one product! Therefore, when you purchase an annual maintenance plan, you will now get both upgrades to your products as well as unlimited phone support. But wait, there's more. No, not Ginsu knives. The price for maintenance is the same as when it did not include phone support! We feel that this new policy toward maintenance will be more in-line with industry standards and will offer our customers better simpler support options. We continue to offer free support via email or our website. This is free regardless as to whether or not you have a maintenance plan in place. We continue to offer 6 months of upgrades and support for any product purchase. In the past, the features on reports were always sorted by the order received from the machine or gage. Based on a customer request, we recently added the ability to sort by feature name. For this particular customer, they would name their features based on the balloon number from the print. For instance, they may name a dimension "001-Hole Diameter" or "050-Roundness". Since the CMM didn't necessarily measure the features in the same order as the balloon numbers, the dimensions would be out of order on the report. Once we added the sorting ability, they are now able to run their reports sorted on balloon number. The only caveat is that the feature labels are sorted alphanumerically (not numerically) since they are text. If you were to sort the numbers 1, 2, 3, 11, and 24 alphanumerically, you would get 1, 11, 2, 24, 3. This is obviously not your intention. In order to get around this, simply add leading zeros. Using our example with leading zeros would yield the desired result: 01, 02, 03, 11, 24. A little planning during the CMM programming stage can lead to easier results when running reports later! Go to Report > Run Report. 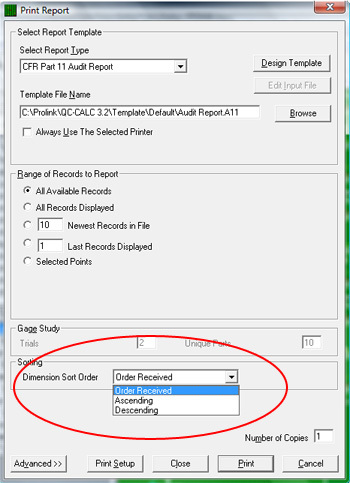 The Dimension Sort Order list toward the bottom determines the sort order on the reports.